Not all people are the same shapes and sizes, so it makes sense that our bed frames shouldn’t just be a one size fits all kind of deal. On average, we sleep around eight hours per night. If we live for 75 years, that’s 25 years spent asleep! So choosing a bed in which to spend most of that time is a pretty big deal. We want something comfortable, that will suit our sleeping habits. We probably want something that is good value. We may even choose something based on aesthetic value. But for some people, there is another factor that is of the utmost importance. According to statistics from the NIH, approximately one in three American adults are considered overweight. With this figure rising and set to grow, there is an increasing demand in the market for beds that support the weight of a larger consumer. We just publish the aricle about mattress for heavy people in 2018. Why Choosing a Special Bed Frame Is Important? If you’re looking for beds in this niche, you’ll need to consider the amount of weight that a potential bed frame can support. Otherwise you run the risk of having the bed frame collapse whilst in use, a potentially dangerous prospect. Additionally, without the right kind of bed frame, the mattress could be prone to sag in the middle, causing the owner to suffer with additional back problems. Almost one third of North American adults are obese or overweight, dealing with a multitude of health conditions caused by obesity such as heart disease, diabetes, high blood pressure and cholesterol, as well as some types of cancer. So we must ensure that our beds, where we spend so much of our time, are not exacerbating these issues. 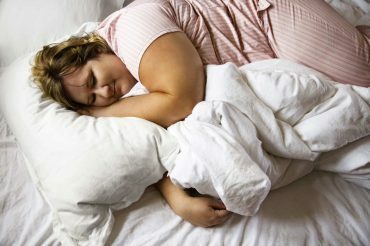 Other problems suffered by larger people include trouble breathing, and joint pain which can make sleeping difficult. Making the right choice in a bed frame can really make a difference in our lives, so getting it right is of vital importance. Instead of buying bed after bed and spending lots of money on products that don’t last, spend time and effort researching the best available option for yourself, and don’t hold back when it comes to spending. 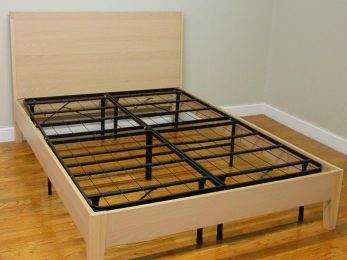 This bed will be an investment, your health can improve drastically from the choices you make here, and buying one bed that will last a very long time will save you money in the end, over buying the cheaper flimsy options that will constantly break as they do not have the capacity to support a larger person. You’ll need to do more research than the average bed buyer, and make sure you know what to look for when choosing a frame. There are several factors you will need to keep in mind whilst determining if the bed is suitable for you. So what will requirements will larger shoppers need to assess when debating the variables for their new bed frame? Support will be the vital number one consideration, and there are several factors that will come in to play to create decent support. What is the bed frame made of? Strong metals are really the only way to go here. Wooden frames look great, but cannot handle the weight of a heavier person over a length of time. Choosing wood for this type of furniture can result in easier breakage, so it’s best to go with a tough, durable metal. You’ll also need to consider the material of the slats as well as the frame, as these will be bearing most of the weight. While some metal frames often come with wooden slats, as before the best choice here if going to be metal. Steel slats would be the best possible option if you are able to find them, and a metal bed frame and slat combination will last you a very long time, no matter what your weight is. Considering that the mattress will be taking an over average weight, try to choose a frame that has a leg supporting the middle of the base. This extra leg will prevent the foundation of the base from sagging, saving you back problems, an uncomfortable night’s sleep, and over the time, the possibility of a broken bed. Using this extra support system will make a lot of difference both to you and your furniture. Another thing to keep in mind is how the combined weight of frame, mattress, and sleeper will affect the very lowest parts of the bed, namely the feet. Weather your floors are hardwood, carpet or something else, you may want to think about protecting the floor by using caps on the end of your bed legs. This will stop an impression being left from the weight of the bed, and will also prevent any scratches from happening should your bed move around slightly. Over a long period of time, large dents can be left in the floor where your bed legs have been, so make sure to conserve your carpet or floorboards by using specially made caps. Of course one of the most important things that you must take care not to forget about is the comfort of your bed. It’s all very well putting a lot of effort into a well-supported bed, but if you’re not happy actually sleeping in it, then the whole thing becomes redundant! These days, mattresses come in all sorts of shapes and sizes, and as a larger person, you don’t have to miss out on comfort because of your size. What’s more, a good night’s sleep has a whole plethora of health benefits, so a comfortable bed can really help you to get healthy and stay that way. However, without a strong base, a mattress is unable to provide proper weight distribution and will sag. So long as you choose a heavy duty foundation, you can purchase the mattress of your dreams that will enable you to have some great rest. Now you have it all to pick your new bed frame. Keep in mind the above points, and don’t forget to check out customer reviews of the frame you’ve set sights on. Hopefully, this will help you make a better choice!